The Livingston Township Public Library rain garden was built as part of the New Jersey Water Savers program, which was established through a partnership between the Rutgers Cooperative Extension Water Resources Program, the New Jersey Department of Environmental Protection, and the United States Environmental Protection Agency. This partnership was created to provide leadership to promote water conservation throughout New Jersey. The New Jersey Water Savers identified and installed multiple demonstration rain garden sites and developed workshops specifically to educate residents about the water needs of New Jersey plant life and how they can do their part to curtail outdoor water waste. 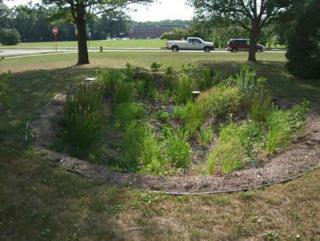 This rain garden manages stormwater runoff from the roof of the Livingston Township Public Library. The Rutgers Cooperative Extension Water Resources Program staff, the Livingston Department of Public Works, and a few volunteers from Livingston installed this rain garden in September 2009. The rain garden was designed and engineered to infiltrate the amont of precipitation produced by a 100 year storm. The native plants that were installed in the rain gardens were purchased from Pinelands Nursery & Supply. The rain garden is maintained by the Livingston Public Works Department.